It is estimated that with the standards in which we are currently living, our yearly consumption is regenerated by our planet in one year and six months. This “overshoot” is a threat to the well-being of humanity and the health and sustainability of our planet. It’s an issue that is all too often unaddressed, set aside or completely ignored due to various factors. What part of my Footprint can I influence? Awareness and education…They are at the forefront of resolving this type of issue, and while I would greatly enjoy sharing all of my thoughts – and opinions – on this topic, I think the dilemma is best confronted in simplicity…one small change at a time (myself included!). So, rather than dive into a controversial, political or otherwise potentially contentious discussion, I’m going to veer of and share a recycling project – yes, I might be considering presidential candidacy in the future, wink! 1. Turn T-shirt inside out and pin bottom of the T-shirt along the hem. Using a sewing machine, sew bottom of T-shirt closed. Flip shirt right side out and lay flat on table, making sure all seams are lined up. 2. Place medium-size bowl about half-way over the neck hole. Using a water-erasable marking pen, trace along the edge of the bowl. Cut along the outline, making sure to go through the front and back sides of the shirt, in order to create an opening for the bag that’s larger than what the neck hole allows. 3. Line up the hems on the front and back side of the sleeve and cut, making sure to go through both sides of the shirt. Repeat on the other sleeve. Tip: A jersey shirt would also work well for this craft, as it is already sleeveless, and it’s made of a great mesh material. 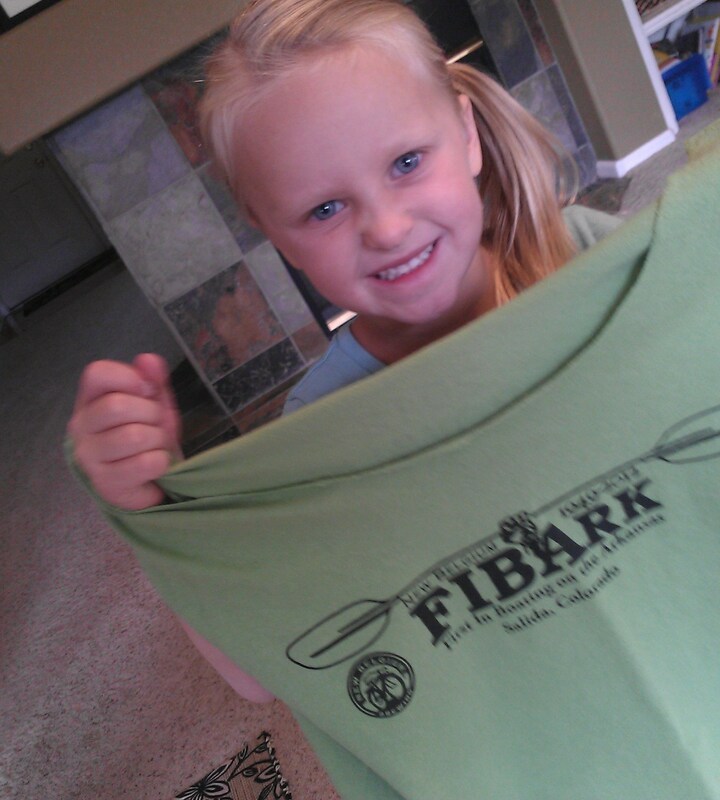 T-shirt bags are extra durable and machine washable. I keep a couple in my vehicle just in case – which has come in quite handy – and I grab a couple more when heading out to the store. Use a variety of t-shirt sizes for bags that will suit your various needs. Yes, absolutely grab a shirt from your child’s collection because as this becomes a new, healthy lifestyle change for you, you’re going to need all sizes! Ok, so it sounds like I’m really reaching this time – taking my green initiative to a whole new level by suggesting that saving this small amount of rather *necessary* cardboard might prove beneficial. While it alone might not save the planet, it could be the very tool needed to spruce up that outdated decor…and every effort counts, right!? 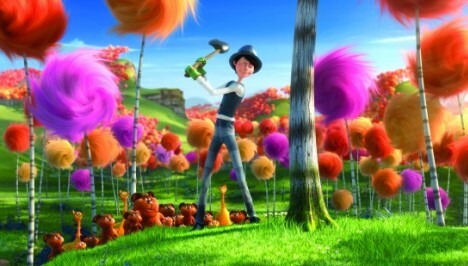 I know what you’re thinking – yes, my eyes are still swirling from the subliminal messages found hidden in the deeps of The Lorax, but I have to say, I did sorta love that flick AND if this catches on, yes, a tree or two could be saved. Just one problem – you’ll have to get over the fact that this beautiful art was created by several trips to the restroom! Sounds classy, I know…but as an avid fan of modern wall art and a huge heart for saving our planet, I’m thinking this could be the new solution to that hard-to-decorate space in your home. Simple, low-cost, beautiful, earth-friendly and with unlimited creative potential. LOVE IT! What do you do with an animation alluding – possibly a little too much – to controversial issues of conservation, politics, religion and various other propaganda distracting from the message in the original text? You pay a little extra to watch it in 3-D! Let LOVE save the world…I think Dr. Seuss might like it. Is it really so bad that Ted might find his passion for a green initiative in school-boy twitterpation? What better reason is there!? He heard “I’d probably marry him right on the spot” …in the voice of Taylor Swift. That was a boy on a mission – he can’t help it that he might save the world too – give him a break, movie critics. AND if you don’t care for the twists in the movie plot or silly, creative animation, you certainly won’t care for the funky tunes ~ but you might like this humorous video! Ode to the criticism of a greed-driven capitalistic system and the evils of excess (caution against putting me into a socialist/semi-socialist box, wink)…a massive ruse alluding to the absurdity of, um, bottled water (don’t pay for what ya might find for #free)…and yes, for goodness sake, plant a tree (the ladies will love ya for it!). I should also admit: I cried, yes real tears, at a 3-D animated film – which was made it a little more difficult to notice all the welling up of tears #benefitofhuge3-Dglasses. See the flick, hug a tree, call me a hippie (grandpa) but I loved this film! GREEN. It’s one of my very favorites and I use it everywhere I can – clothing, linens, toiletries, house paint, handbags…yes, quite liberally, with really just one exception: my thumbs. So, come March 17, I’m generally safeguarded from the random, traditional pinch. However, this year, I’m risking it all, putting a little spin on things and going out on a limb (or three owls on a tree branch – to be exact) for my GREEN InITiaTIvE…oh, in a lovely shade of PINK! No, I’m not trying to scare off readers with the title of this article – I just want to be real clear in case my advice doesn’t work out so well and moms everywhere come looking for me, yikes. So, now that you’ve been warned, feel free to read on! Summertime…these long, lovely days pose ample opportunity for several quick but beautiful alterations to your home’s appearance. Take advantage of the warm weather, leisure time and all the extra help you have now that your kiddos are out of school. Reality: you’ll have to squeeze it in between playdates and laundry AND convince your kiddos it’s fun, but they will likely enjoy seeing the results and knowing that they were part of the process – they might even learn something along the way…like that mommy gets really frustrated with paint handprints even when done artfully on the wall ~ but it does make for a sweet memory, right? A quick way to liven up a room is by adding some color. Many decorators suggest combining colors opposite each other on the color wheel. I use a variety of greens in our home and have accents in red, rusty reds and oranges. I throw in a teal here and there to bring it all together. Sounds funky, right? Done the right way, I think almost any scheme can be successful. Just remember – it has to be what YOU like, so do it your way and don’t be afraid to break the rules because there are no rules, just guidelines to help you along the way. I suggest starting with one color you love. For me, this would be a shade of green. 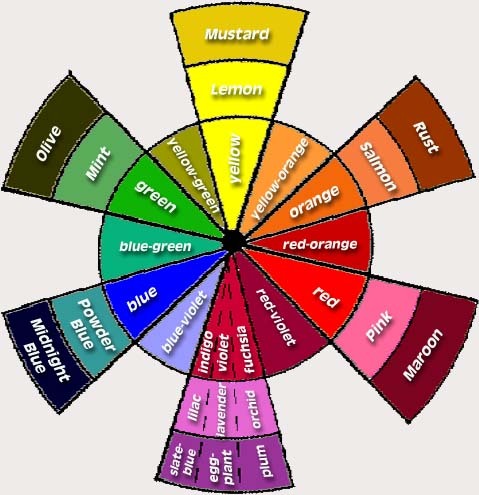 Find your color the wheel. Take a look at the colors next to your choice – these “next to” colors will always accompany nicely because they coordinate and match. Sounds easy, but here’s the tricky thing…if all your colors coordinate perfectly, you may be loosing some of the possible effect. Most rooms will have a better overall look if there is an opposite color splash – to keep it interesting. With green, I choose to blend olive and a bit of blue-green or teal. Then I look directly across the color wheel for some splash inspirations. With the shades of green I’ve chosen, I prefer a rusty red or the red-orange. This color pairs well with reds and oranges, so I shop with that in mind. Neutral colors can be thought of as a clean slate – something to work with, not around. I like to have most of my wall space in a neutral shade and vary the shades for depth – then, I can add color as I please. An example of using neutrals includes the ability to add a dramatic paint accent – applied to a small portion of the room – over a fireplace, on a dividing wall or any space providing simple paint boundaries in a small area (too big and it won’t be an accent.) Talk with a paint store consultant for suggestions on the best shade of paint for you needs. I prefer neutral furniture as well as walls…some dark, some light. That way, I can switch up my color craze as the times and trends change and won’t have to spend a fortune on staying in “the now” with our large purchases. Throw pillows are more affordable than loveseats and couches. However, we have inherited a good amount of furniture, and I’ve discovered that if you wait long enough, the style might come back around, wink. Nope, not time for a break yet. We’re going to use some examples to formulate a plan. Sometimes I think I know what I want to do but then I see it in a magazine – or see something better – and realize I was all wrong. So, find some looks you like and use that as a framework for what you’ll do with your colors. After shopping at home, shop at your neighbor’s homes #yardsales. Don’t forget to check out off-retail shops, and then, if you see something you love in the mall, you’ll have the extra cash to get it. I love a designer look but not the price tag. Everything looks better with a touch of green…and I’m not just saying this because it’s my primary decorating color of choice. I’m certainly not an expert on Fung Shui, or any decorating theories for that matter, but I do like the way the Fung Shui system of aesthetics pulls a mix of nature indoors. For extreme simplification: add plants to your decor. To prove I’m not certified: use fake ones too – honestly, we’re moms, and keeping our children, spouse, and a pet(s) alive is a lot of work – we can’t expect to have a house full of living plants, beautiful yard, garden and potted flowers too, whew. So, absolutely, add a lovely, fake plant of your choice…and if you mix it in with living ones, people might not even notice. 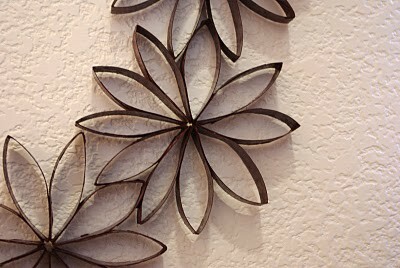 It’s a great way to brighten a dark corner or add flair to an otherwise plain overhead space. I love to see a home with an assortment of color usage. Each room can have it’s own, individual look…but it helps to transition. The way I do this: I choose “across from” colors as my main choices – when the rooms are visible from one to the other. I then select “next to” colors from the wheel to transition. The transition colors are the colors I choose to be in sight when standing in one room, looking into the next. The “reds” room in our home has red-orange visible from the “greens” room. So, when a visitor comes to the front door, they can peer in and see the “greens” transition into the “reds” room with the help of the red-orange accents (curtains and throw pillows.) The deep red color splash atop the fireplace mantle is not visible until entering the “reds” room. A teal potted plant is also used as a transition item – it sits atop a half-wall between our “greens” room and our “reds” room. The teal planter is visible from both rooms and moves one from the “reds” into the “greens” nicely. With all that being said, hard to believe there are no rules, right? Just remember that you and your family have to like it and that’s what matters most. Enjoy the time decorating together…and laughing when it doesn’t work out quite right. I had the opportunity to shop early this year at the Just Between Friends Sale in the new, larger location in Castle Rock. The extra space is great and having the entire sale all in one room is very convenient. Everything is sorted and well-marked, so be sure to come with a detailed list – and you’ll no doubt find a lot of extra goodies you don’t really need. Parking was abundant and the check-out system has been revamped to flow more smoothly. Several seasoned shoppers brought their wagons, so don’t be afraid to pull up in your moving van if that’s the kind of shopping you’re game for! I shadow shopped with an expert this year – partly because I’m a self-proclaimed wimp at these things and because I figured I could use a good lesson from a bargain shopping authority. My mentor loaded her wagon high, crossed off her list and snatched some great deals to stash away for her children’s birthdays and Christmas (loved this idea). She explained that when she returns home, she sorts through her current belongings and pulls items for resale, which she will rotate between JBF sales in the area. She has a full system, creating an art – and business – out of consignment sales. Despite the fact that I’m still learning, I’d say I did quite well. Some of the deals I picked up include: a floatie swimsuit for my three-year-old, Crocs for both kids, Abercrombie running pants for my son and a like-new denim Gap overcoat for my daughter. I did notice that because consignees price their own items, there are similar items marked at various prices, so look closely. I did see many excellent brand names and clothing in great condition – several items were brand new. I had to bypass many gorgeous dresses, knowing that my little one would absolutely refuse to put it on (we’ll hopefully move past this stage soon). There were also many baby items: strollers, car seats, you name it. Definitely the place you want to shop if you’re in the market for this type of big gear! Ok, so it’s not exactly from the trash, but it did come from Nana’s yard sale. When she gladly handed it over to my seven-year-old to take home, I wasn’t thrilled. A large, heavy item with a glass globe on top…could she have checked with me first? Not if she wanted to get rid of it I guess. So, I hesitantly took the carousel gumball machine, cleaned it out, and after a few months of searching for gumballs, filled it with a large bag of M&M’s candy. Well, to my surprise this was one of the most fabulous candy “dishes” we’ve ever had! Normally, I use an unofficial two-step approach for candy in our house…first, I display the candy in a glass vase on the fireplace mantel – it’s a fun way to decorate and the kids love it. Then, when the holiday is over, if there are any candies remaining in the vase, I put them into the hodgepodge candy bucket (we hide that on the top of the refrigerator). I admit, the bucket is not the place I like to dig for a sweet fix (maybe if I’m desparate), but it’s a hit with the neighbor kids! No grimy hands dip into the gumball machine. Coins collect in the base – a treasure to be found when we switch candies! 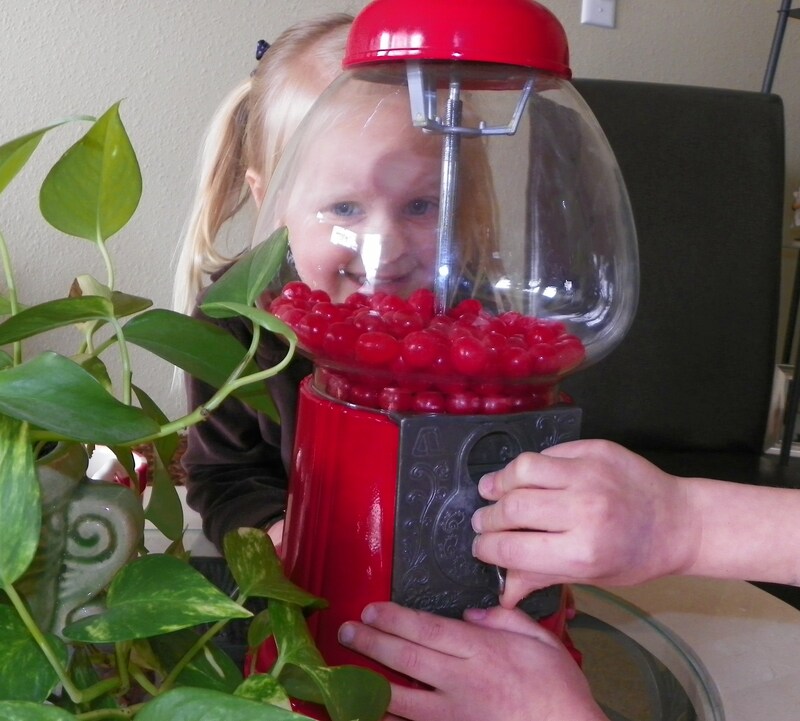 Candy is dispensed in small serving sizes…and the kids don’t seem to notice. This is to my benefit as well. No need to cover the container. 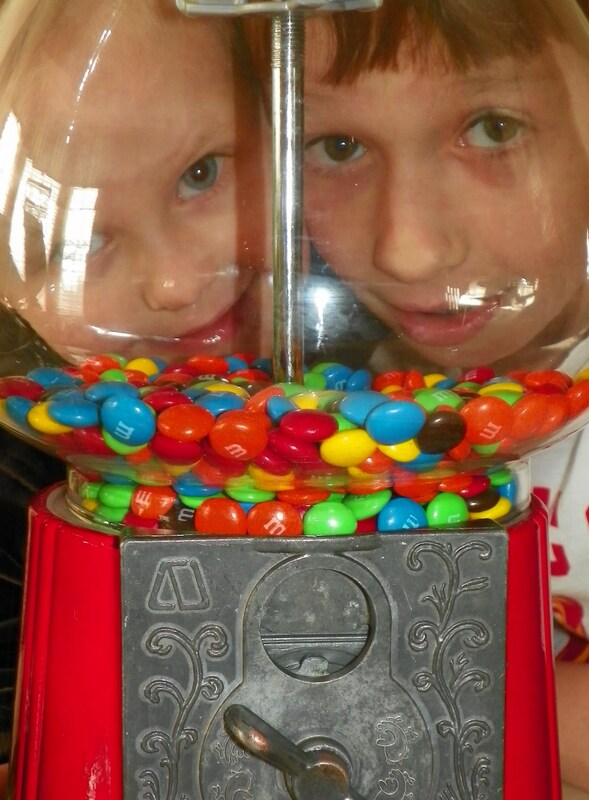 Our candy lasts longer – I just switched out the end of the M&M’s and added our cherry sours. 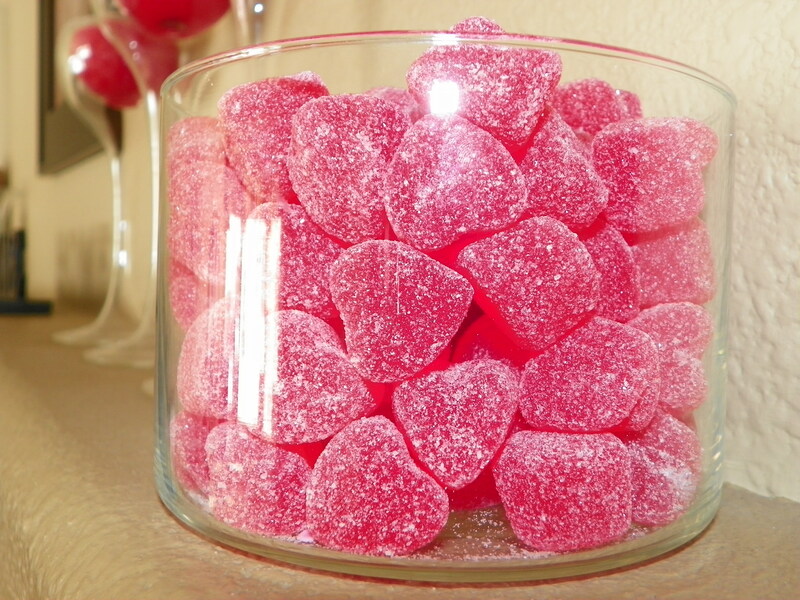 …I still put a vase of cinnamon hearts on the mantel, but after a few days of kids’ hands, I’m not going to touch that candy, ha. Time to organize your craft area? How about a reason to finish that sewing project you started and never finished? I first learned about Firehouse Quilts while visiting the Denver Firefighter’s Museum downtown. This non-profit organization does wonderful things for women and children, and they offer several volunteer opportunities including tasks for those who don’t sew. Check their website for specific volunteer/donation information: http://www.firehousequilts.org/. Firehouse Quilts volunteers make snuggle quilts and donate them to Colorado fire departments, local ambulance services, low-income hospitals, victim advocate offices & full sized quilts to Women’s Crisis Center in Douglas County to be given to children & their mothers in time of crisis. I started working on this quilt several years ago when I was first learning (and I haven’t improved much since then). It went unfinished until recently – partly due to the arrival of our second child – but also because I wasn’t sure what to do with the wild piece of art it had become. The fabric I chose included odds and ends I had on hand, which made for a funky look. It didn’t match any room in our home, so I figured I’d move on to another project and finish that one later. When I saw that Firehouse Quilters use fun, kid-friendly fabrics in an array of designs and colors, I knew what I was going to do with it. So, I made the finishing touches and completed my masterpiece. The best part of all this was not finding a good home for a crazy quilt, but seeing that my children understood that our quilt would go to help someone else in their time of need. I think they were able to relate well with the feeling of wanting a cozy blankie to cuddle when dealing with a frightening situation. I hope this experience will help grow their compassion toward others and empower them to make a difference. I love coming up with new, fun ways to recycle, and while some of my zany ideas don’t work out – sewing lace on boy clothing is not always a good look – this was a successful one. It was great quality time together, and my kids enjoyed creating something they can use. This project may help your kids stay organized, maybe, but it’ll definitely look cool. Start by tracing (or letting the kids trace) the cup circles on the top of the box, you’ll cut just smaller than the circles so the cups can sit in the holes and be supported by the edges of the box (cutting takes some muscle – the cardboard is thick). Kids can place the cups in the holes and secure edges with a little glue. Finally, close the box using the packaging tape and let your kids put their crayons and colored pencils into the cups. 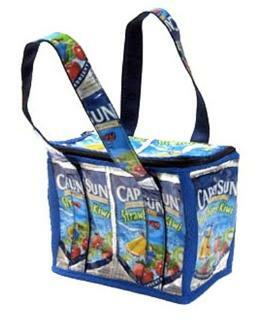 Wondering what to do with all those Capri Sun juice packages? TerraCycle does great things with them – check it out at http://www.terracycle.net/. Schools and other organizations collect them too – TerraCycle pays $.02 per pouch. During a recent visit to the Denver Fire Fighter’s Museum, I learned about a really cool non-profit group, Firehouse Quilts of Colorado, Inc. This group of volunteers collects, sews, and donates quilts to fire departments, low-income hospitals, victim advocate offices, and women’s shelters so that the quilts can be passed out to women and children to help provide comfort during a difficult time. The volunteers collect fabric donations and schedule sew days at the Northridge Recreation Center in Highlands Ranch – no experience necessary. 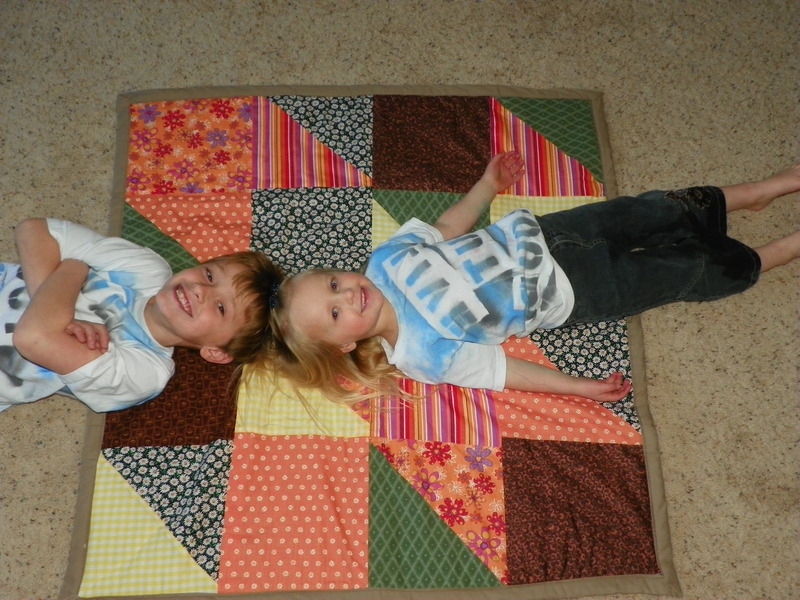 You can also donate assembled quilts either 45′ square or twin size. Any style or pattern will gladly be accepted. Detailed information can be found on their website at http://www.firehousequilts.org/.